The limitations of Jefferson’s design for the Academical Village were apparent almost immediately after the University opened. Professors and staff designed ad hoc additions for the pavilions, while kitchens and smokehouses were built in the gardens. They also commandeered old spaces to serve new needs. 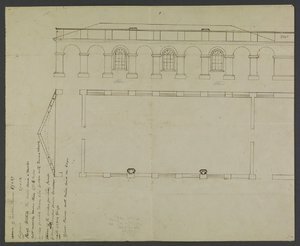 John Hartwell Cocke, an original member of the Board of Visitors (the University’s governing body), drew this plan in 1840 to convert the Rotunda’s underground walkways into lecture halls. Jefferson had intended that these spaces provide cover for those walking between the Rotunda and the colonnades during inclement weather.